Last week, recipients of Utah State University’s Extension Awards were announced, honoring notable contributions from extension researchers and educators across the state. While most individuals are unaware of how food gets from farm to table, Dr. Kynda Curtis, a professor and extension specialist in applied economics at Utah State University, is all too familiar with the process. “I’ve specialized over the years in, more towards small farms and so, working with farmers and ranchers in the state and actually regionally, so in Nevada, Idaho, Utah, parts of Montana and parts of Arizona and looking at consumer preferences for local foods, organic foods, different types of food labeling aspects, non-GMO, that type of thing,” she said. Curtis, who has been working in extension for over 16 years says her primary research focus is food and agricultural marketing. Which means she works to help smaller growers not only expand their business, but also create new products and cater to shifting consumer preferences. See an example of this in a recent study on direct market sales here. “One of the things that we found through research that I did is that prices for produce were higher in the off-season so if producers can have something available a little earlier or a little bit later than other people they tend to get higher pricing so that’s a way to increase profitability and the hoop-houses which are a season extension technology are the best way really to do that,” she said. Hoop houses are helping farmers extend their growing seasons by producing winter fruits and vegetables. Curtis says hoop houses are fairly inexpensive to construct and allows farmers to competitively price their goods by extending their growing season. 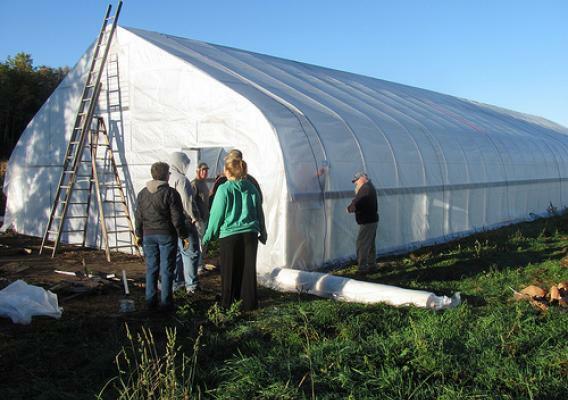 “So basically they bring up the temperature inside the hoop house and you can start growing for example in Cache Valley as early as February when there’s still a lot of snow and very cold weather,” Curtis said. Not only does this help consumers who may be craving a certain produce item in March, it also helps farmers generate income on a year-round basis. And for this and other ongoing research Curtis was awarded the USU 2019 Extension Specialist Career Award. Learn more about USU extension here.